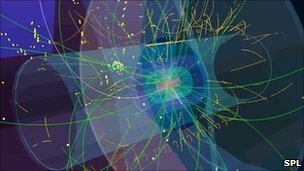 A "Higgs-like" particle was first seen at the Large Hadron Collider last year. Since detecting the particle in their accelerator experiments, researchers at the Geneva lab and at related institutions around the world have begun to theorise on the Higgs' implications for physics. One idea that it throws up is the possibility of a cyclical universe, in which every so often all of space is renewed. "It turns out there's a calculation you can do in our Standard Model of particle physics, once you know the mass of the Higgs boson," explained Dr Joseph Lykken. "If you use all the physics we know now, and you do this straightforward calculation - it's bad news. "What happens is you get just a quantum fluctuation that makes a tiny bubble of the vacuum the Universe really wants to be in. And because it's a lower-energy state, this bubble will then expand, basically at the speed of light, and sweep everything before it," the Fermi National Accelerator Laboratory theoretician told BBC News. Dr Lykken was speaking here in Boston at the annual meeting of the American Association for the Advancement of Science (AAAS). He was participating in a session that had been organised to provide an update on the Higgs investigation. The boson was spotted in the wreckage resulting from proton particle collisions in the LHC's giant accelerator ring. Data gathered by two independent detectors observing this subatomic debris determined the mass of the Higgs to be about 126 gigaelectronvolts (GeV). That was fascinating, said Prof Chris Hill of Ohio State University, because the number was right in the region where the instability problem became relevant. "Before we knew, the Higgs could have been any mass over a very wide range. And what's amazing to me is that out of all those possible masses from 114 to several hundred GeV, it's landed at 126-ish where it's right on the critical line, and now we have to measure it more precisely to find the fate of the Universe," he said. Prof Hill himself is part of the CMS (Compact Muon Solenoid) Collaboration at the LHC. This is one of the Higgs-hunting detectors, the other being Atlas. Scientists have still to review about a third of the collision data in their possession. But they will likely need much more information to close the uncertainties that remain in the measurement of the Higgs' mass and its other properties. Indeed, until they do so, they are reluctant to definitively crown the boson, preferring often to say just that they have found a "Higgs-like" particle. Frustratingly, the LHC has now been shut down to allow for a major programme of repairs and upgrades. "To be absolutely definitive, I think it's going to take a few years after the LHC starts running again, which is in 2015," conceded Dr Howard Gordon, from the Brookhaven National Laboratory and an Atlas Collaboration member. "The LHC will be down for two years to do certain repairs, fix the splices between the magnets, and to do maintenance and stuff. So, when we start running in 2015, we will be at a higher energy, which will mean we'll get more data on the Higgs and other particles to open up a larger window of opportunity for discovery. But to dot all the I's and cross all the T's, it will take a few more years." "I think that idea is getting more and more traction," said Dr Lykken. "It's much easier to explain a lot of things if what we see is a cycle. If I were to bet my own money on it, I'd bet the cyclic idea is right," he told BBC News.